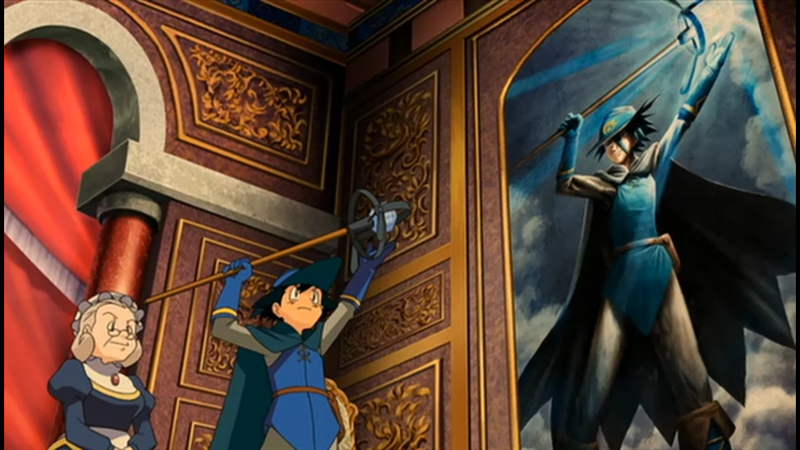 Satoshi strikes a pose like Sir Aaron as part of the Oldaran Castle Hero’s Festival. As of this review, we’ve reached the half-way point of the Pokemon movies! Yay! This time we’ll be looking at the 8th movie, Lucario and the Mystery of Mew, known in Japan as 「ミュウと波導の勇者 ルカリオ」(lit. “Mew and the Hero of the Wave: Lucario”). Premiering in Japanese theaters on July 16, 2005, and coming direct to American home video on September 19, 2006, this film also marks the debut of Generation IV Pokemon, introduced to the series thanks to Pokemon Diamond and Pokemon Pearl. For the 4Kids English dub fans out there, this is also sadly the final time the old 4Kids voice acting cast would reprise their roles for a Pokemon film. Is Mew and the Hero of the Wave: Lucario (hereby Lucario) the send-off the cast deserves? Or is it another dip in the graph for the Pokemon movie franchise? Let’s look! Hundreds of years ago, there was a great war in the kingdom of Oldaran (known as Cameran in the English dub). Two unknown armies, one clad in red armor, the other clad in green, threatened the peace of the people of Oldaran. Sir Aaron and his Lucario, both guardians of the queen, named Rin, and adept users of the mystical energy known as Aura, frantically seek a way to peacefully end the conflict before the palace is destroyed. Aaron tells Lucario however that he plans to leave the palace. Suspecting his long time friend to be a traitor to the kingdom, Lucario tries to reason with Aaron and ask him why he is leaving, but Aaron simply uses his powers to seal Lucario inside of a gem contained in his staff. Leaving the trapped Lucario behind, Aaron continues on towards the Tree of Beginning. Shortly after, a bright light begins to emanate from the tree. The soldiers and Pokemon of the red and green army as well as Queen Rin from a balcony at the castle, see this light and all lose their will to battle. From that day forth, peace spread across the world and war never came to the kingdom of Oldaran ever again. Returning back to the present day, we catch our protagonists, Satoshi (Ash Ketchum), Takeshi (Brock), Haruka (May), and Masato (Max) making their way across the bridge towards Oldaran Castle. It’s the annual Hero’s Festival wherein the Oldaran Castle gates are opened to the public for festivities. As part of the celebrations, there is a Pokemon battle tournament which decides who will play the role of the ancient hero, Aaron, as part of the opening ceremonies. Satoshi enters the tournament and after numerous rounds, succeeds in defeating all of his opponents to become the year’s champion and gets to play the part of Sir Aaron in the opening ceremonies. During the ceremonies, Satoshi and his friends let all their Pokemon out of their Poke Balls to enjoy themselves while the rest stay with the rest of the trainers at the festivities. 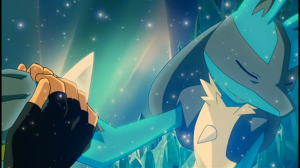 When Satoshi takes hold of Sir Aaron’s staff as part of the opening ceremonies, a mysterious light started to shine from the staff’s jewel and, from that light, Lucario appears. Trapped inside of the staff’s jewel for hundreds of years, Lucario is freed thanks to Satoshi having the same type of Aura signature that Sir Aaron had. Shocked and confused at the sudden events, Lucario begins to frantically run around the castle searching for anything familiar. Queen Ilene, a descendant of Queen Rin from the time of Sir Aaron, explains to Lucario what happened since Lucario was trapped, saying that it is a brand new era and that Sir Aaron and Queen Rin are long deceased. He also learns the ancient legend in which Sir Aaron saves the kingdom from the war and brings peace to the land. Lucario, the memory of Aaron abandoning his duties still fresh in his mind, refuses to believe this. Lucario decides to continue protecting the royal family and forms a new pact with Queen Ilene. Meanwhile, Satoshi and friends’ Pokemon follow the lead of a mysterious Pokemon who has the ability to transform. This Pokemon reveals itself to the Pokemon, but not the humans, to be Mew. Mew oftentimes comes to Oldaran Castle to play and shows the rest of the Pokemon its secret hideout in the attic of the castle filled with toys. Over on a nearby rooftop, one of the combatants Satoshi defeated in the tournament, Kidd Summers, gives orders to her two Weavile to place a tracking device on the Mew. While trying to place the tracker, the Weavile panic and attack Mew and the rest of the Pokemon in the attic. The Pokemon, sensing the danger, all scramble to protect Mew from these two assailants. Mew however takes off back towards its real home in the Tree of Beginnings and, in the process, takes along Satoshi’s Pikachu. The rest of the Pokemon quickly scramble back to their trainers to report to Satoshi what happened. Hearing this, Queen Ilene gave Satoshi and his friends permission to go to the Tree of Beginnings to find Pikachu. Lucario is instructed to lead the way, but Kidd Summers shows herself and offers to help the team. It’s revealed that Kidd is a world-renowned explorer who has explored uncharted lands and has performed many impressive feats of travel. She originally planned to put the tracking device on Mew as she wanted to explore the secrets of the Tree of Origins, but she realizes her Weaviles must have scared it and Pikachu off. She agrees to help them out and the crew set off in her Hummer, guided by Lucario. Every time they stop to rest during the trip, Lucario and Satoshi have a conversation about why Satoshi tries so hard to save his Pikachu and whether or not Pikachu truly believes in Satoshi. Insulted, Satoshi gets into a tussle with Lucario. Finally at the Tree of Beginnings, the team begins to explore the inside. The tree, larger than any mountain due to its age and long growth, is home to a variety of rare and ancient Pokemon, including thought to be extinct. However, as they explore the inside, the crew is attacked by the guardian trio of the Tree of Beginnings, the ancient Pokemon known as Regirock, Regice, and Registeel. It turns out that the Tree of Beginnings is a giant organism and considers the humans to be some kind of virus. Besides the Regi trio of Pokemon hunting them down, the tree also employs its own form of white blood cell defense in the form of an orange gelatinous substance that consumes the humans and drags them into the tree. Slowly, each member is swallowed. Eventually, it is only Kidd and Satoshi who remain in the desperate search for Pikachu while trying to find a way to calm down the Tree of Origins. Satoshi finds Pikachu, but he and Kidd are quickly captured by the orange goop. The tree begins to absorb them. Satoshi’s Pokemon and Pikachu, grieving over the loss of their trainer, begin to cry. Seeing how sad they are, Mew intervenes and communicates to the tree to release the humans. Free once more, Satoshi and his Pokemon happily reunite and embrace in a group hug. However, there appears to be something wrong with Mew. After the humans are released, it starts to seems ill and exhausted. The humans figure out that commanding the tree to release the humans drained Mew of much of its energy. Since the health of the Tree of Beginnings is directly tied to Mew’s own health, the condition of the tree begins to deteriorate and it withers, threatening to crush the Pokemon living inside of it. Lucario, Satoshi, and Kidd frantically seek a way to restore Mew’s energy and Mew leads them to the heart of the Tree of Beginnings where they find a a large ore deposit of the same kind of jewel that Sir Aaron used in his staff to channel Aura. Nearby a particularly large deposit, Lucario is surprised to find Sir Aaron’s hat and gloves. A recording from Sir Aaron’s memory stored inside of a crystal begins to play upon sensing Lucario’s aura nearby. Aaron reveals through this memory that he regretted trapping Lucario inside of his staff, but that he did so to protect his friend from following him to the Tree of Beginnings. Just like now, Aaron came to the tree to restore Mew’s health as the cause of the war was the Tree of Beginnings starting to wither. Aaron channeled all of his life force through his Aura into the heart of the tree to restore its energy and return its life functions back to normal. In doing so, he ultimately sacrificed his own life to save the tree. Finally understanding why Sir Aaron abandoned him and the rest of the kingdom, Lucario breaks down in tears. After collecting himself, Lucario channels his Aura into Mew to restore its health. Satoshi, remembering that Lucario sensed the same Aura signature that Sir Aaron did inside of him, channels his own Aura into Mew alongside of Lucario. However, at the point where his life begins drain, Lucario shoves Satoshi out of the way and gives Mew the entirety of his life force, restoring Mew’s health and stopping the tree’s withering process. Exhausted from the effort, and on the verge of death, Lucario sits down next to Aaron’s hat and gloves. Thanking Satoshi for helping him uncover this truth, Lucario states that he will consider Satoshi as a friend from this point forth and smiles, thinking that he will return to Aaron’s side, as his body disappears into Aura particles. The final scene of the film shows Satoshi and the rest of the crew standing on a branch on the Tree of Beginnings looking over the lands and appreciating the beauty of nature. Masato offers Lucario some chocolate. 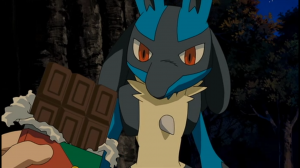 Even the serious Lucario cannot ignore the sweet allure of a Hershey’s bar. Fans of the franchise will note right off the bat that the main protagonist Pokemon of this film, Lucario, is not a legendary Pokemon at all. This would be the first time since Entei: Lord of the Unknown Tower that a non-legendary Pokemon plays a major role in the plot of a film and the first time ever the non-legendary Pokemon is a full-fledged character and protagonist. Though it’s common knowledge that even the simplest Pokemon possess human-level intellect and comprehension, this Lucario ups the ante. Thanks to training under Sir Aaron’s tutelage, Lucario is able to fully understand and speak human language telepathically and boasts exceptional Aura powers that rival even the power of legendary Pokemon. More on Lucario himself in a bit. A green army Tyranitar butts heads with a red army’s Aggron during the great war. Regardless of what you end up thinking of Lucario as a whole, you can’t deny that the first 10 minutes of the film are among the most interesting scenes in any Pokemon film. 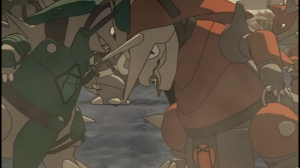 The war between the green and red armies reveals a lot about the Pokemon universe that kids and adults alike could only speculate about before. Are there any kind of large-scale conflicts in the world of Pokemon? Have people used Pokemon before as machines of war? What was life like before modernity? All these get touched upon within the first 10 minutes of this film. It isn’t as if these themes never existed; after all, practically every Pokemon movie thus far has starred some kind of villain that hopes to abuse the power of Pokemon for their own gain. Lucario opts against reusing another Saturday morning cartoon villain archetype and opts instead to portray conflict in the past in a more realistic light through the war that Sir Aaron worked to stop. In fact, the whole shebang sounds very similar to a children’s fairy tale, no? That’s exactly what the directors thought as well. It’s revealed that the whole tale from the past was taken from a story book a mother was reading to her daughter before bed. What bothers me even more is this connection between Satoshi and Aaron is the reason why Lucario himself is ultimately inconsequential. Besides acting as a connection to the past and with Sir Aaron, Lucario’s role in the movie is very thin. He shows the crew how to get to the Tree of Beginnings, throws a few Hadokens, and then sacrifices himself at the end so that they can conveniently leave him out of future stories and Satoshi can live on. Lucario fades away into Aura energy after giving his life force to Mew. Aside from being fairly useless, I found Lucario very unlikable since he acts like an angsty teenager the whole movie. Things constantly remind him of times he has spent with Sir Aaron. His interactions with Satoshi all involve him questioning Satoshi’s motives in saving Pikachu from the Tree of Beginnings. Before I watched this film for the first time, I knew that Lucario is a particularly popular Pokemon in Japan, and I figured that it was because of this film. Maybe it’s my tiny American brain, but I can’t comprehend how anyone can find this Pokemon to be “cool,” or could even be particularly sad when he dies at the end. It’s similar to how I felt for the death of Latios at the end of Latias and Latios: The Guardians of Alto Mare. I understand it’s SUPPOSED to be sad, but it doesn’t really make me FEEL sad. It’s poor execution of a good idea. I still can’t shake the feeling that Lucario was at some point two separate movie ideas that eventually got merged into one. One of those ideas was another boring adventure starring Satoshi stumbling into another adventure requiring him to save the world. The other idea was for a fleshed out story that would explore a different era in the Pokemon world. I know he’s the protagonist of the animated franchise, but for once I feel that using Satoshi as the main character hurt this film’s potential. There is a truly great ocean of ideas at play here… and yet the writers decided only to dip their toe in. Despite these missed potential, Lucario is fairly competent. Every single conflict ties up coherently, and we get to see some rather grand scenes with great settings, full of cool and adorable Pokemon fan service. It’s not a bad movie, just one that’s significantly less compelling than it could have been. I stumbleupon on a daily basis. It will always be useful to read articles from other authors and practice something from their sites.